It’s not easy to write about oneself, or at least it isn’t for me. My short bio gives you an idea of where I’ve been and how I got here now, but it’s kind of like a simple line drawing – adding some shading gives it a lot more depth and nuance. So here are a few factoids to know about me, some random brushstrokes to fill in the picture a little. In a previous life (but this incarnation), I was a flight attendant for United Airlines. Oh, and a licensed manicurist too. 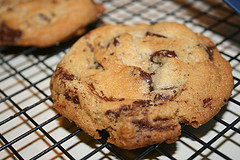 My boyfriend considers himself an authority on chocolate chip cookies and has declared mine to be the best ever. I’m a 6 on the Enneagram, which is a scarily accurate assessment of my personality. And if you don’t know what the Enneagram is, I guarantee that at some point, I’ll try and explain it to you. I’m a worrier. I worry a lot, about almost everything. Typical Enneagram 6. I love chocolate and try to eat a little bit every day – the darker and more bitter it is, the happier it makes me. I am a fourth-generation native Californian. I’m a crafty kind of gal. Currently, I’m on a knitting jag, but I’ve also been known to needlepoint, bead, cross-stitch, crochet, scrapbook, sew, and any number of other handcraft pursuits. I start a lot of stuff that gets finished – eventually – and some that doesn’t. Music is essential to my life, on a par with breathing. All kinds of music (though I confess the jury’s still out on opera). I am a recovering perfectionist who’s still searching for a 12-step program. 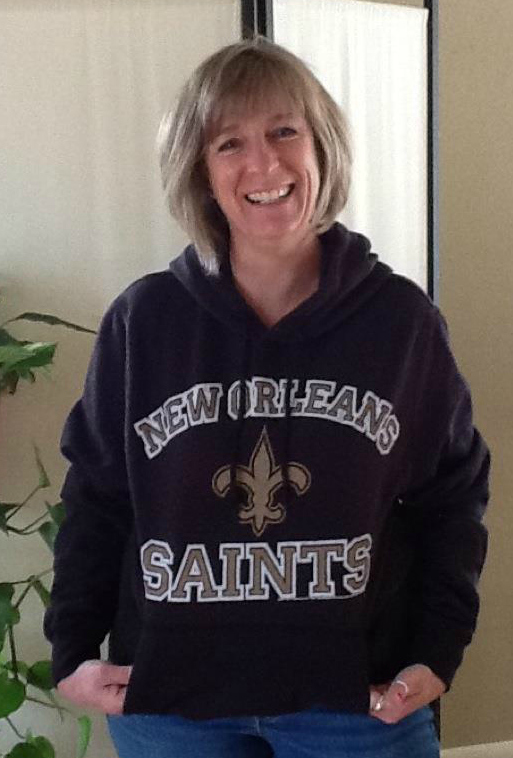 I love New Orleans and just about anything related to that city, including the New Orleans Saints football team… Who Dat?! In the 5th grade, I won an award in American History from the Daughters of the American Revolution. I have outlasted breast cancer. I don’t much identify with the term “survivor” and I don’t like the color pink. No matter how hard I’ve tried, I can’t seem to actually establish an ongoing meditation practice – yet. I keep trying because it matters. These days, I’m getting a lot closer thanks to Susan Piver and her Open Heart Project. According to my aunt Linda, the family genealogist, both Daniel Boone and Kit Carson are in my family tree. I am an “information junkie”. If you’re wondering what that means to me, fabulous Molly Gordon explains it all in this blog post. I played Fantasy Football for 11 years. I won 3 championships and narrowly lost a chance to make it 4. It made me realize that I’m very competitive, and not always in a good way, so I stopped. I miss it. You’d never know it to talk with me, because I can hide it pretty well, but I’m an introvert. I took 2nd place in a district-wide typing contest in high school. 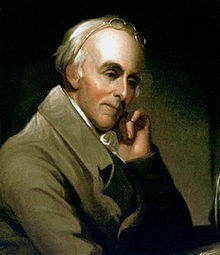 I am a direct descendant of Dr. Benjamin Rush, a signer of the Declaration of Independence and one of the Founding Fathers of the United States. Dr. Rush is considered the “father of American psychiatry”. I got my first computer in 1987. It was an IBM 286, with an amber video display terminal, running MS-DOS. I was immediately hooked on technology.